The schism within the Republican Party over Donald Trump has confounded all attempts to map it out. The Trump-versus-#NeverTrump split does not follow the right-left ideological lines that defined the spats endured by Republicans in 1964 or Democrats in 1972. Oddly enough, the polarizing candidate occupies the center of the remaining presidential field, with one opponent on his right (Ted Cruz) and another on his left (John Kasich). Nor is the party splitting along geographic lines, given that Trump has won states in every region. Instead, the divide runs high-low, splitting conservatism as an idea from conservatism as an instinct. The policy content of the primary fight has receded almost entirely. Trump may be more effective than other Republicans at harnessing certain conservative impulses — xenophobia, nationalism — but he barely differs from Ted Cruz in the specific proposals in which he expresses them. Trump has attracted the support of the majority of Republican voters who favor higher taxes on the rich, but Trump himself would reduce them. Trump and Cruz oppose comprehensive immigration reform and have postured as tougher than each other without settling any specific disagreement. Trump attacks free trade more viscerally than other Republicans, but both he and Cruz have the same stance (oppose the Trans-Pacific Partnership, promise to implement some unspecified better deal). Trump is promising to appoint conventional right-wing jurists to the bench. 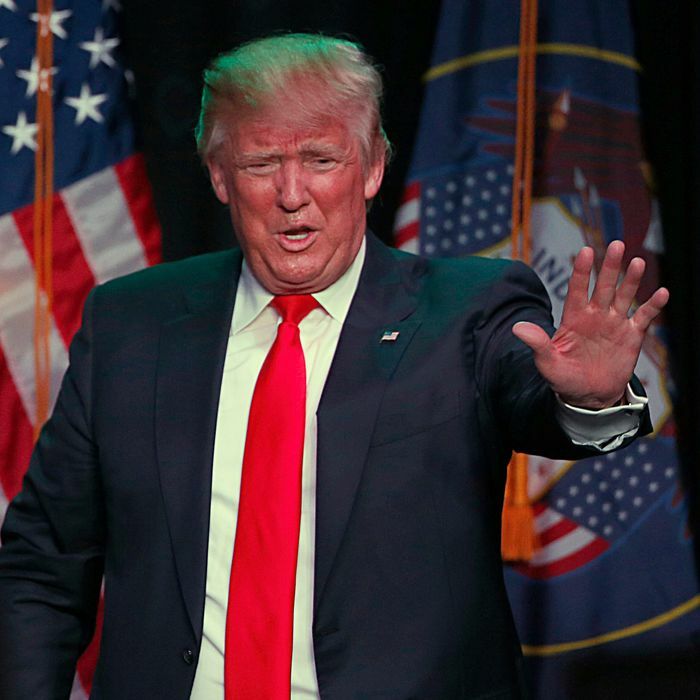 There is no longer any substantive wedge between the GOP and its front-runner. Instead, Republican-elite loathing for Trump has three sources. First, they recognize that his deep unpopularity among the general public makes him a historically awful nominee. Second, his egomania, lack of interest in policy, and history of off-the-reservation statements and behavior give them justifiable reasons to doubt he will stay committed to their agenda even if somehow elected. And third, they find his persona repellant. That last factor — the visceral loathing for the man himself that pulsates among his opponents — has become the highest-order question in the Republican race. Other Republican candidates, who began the race defining themselves on their own personal and ideological terms, now define themselves in relation to Trump’s persona. Do they ignore him, like Jeb Bush tried to do? Imitate him, as Rubio did? Hold themselves up as the high-minded opposite, like John Kasich? Launch personal confrontations, as Ted Cruz did yesterday? The race is dominated by the contrast generated by the projection of Trump’s personal qualities onto the rest of the field. Kasich and Cruz are guest hosts on The Trump Show. There are certain forms of nonsense all Republicans must believe (or leave unchallenged). Ronald Reagan brought down communism by telling Gorbachev to tear down the Berlin Wall; global warming is fake or overrated; the Bush tax cuts did not cause a deficit problem, etc. But Trump has introduced an entirely new category of nonsense that is unrelated to the Republican program, and mostly pertains to Trump himself. He lies about things like his polling, his businesses, whether he has said the things he has actually said, whether Mitt Romney is even Mormon. The premise of Trump’s candidacy is that his supporters have to buy into a cult of personality so total they will accept even his most preposterous or obnoxious statement. That Trump, and Trump alone, can make Mexico fund a massive border wall is his most famous campaign promise and a symbol of the suspension of disbelief that is the heart of Trumpism. In an interview with Ana Marie Cox, Republican strategist Rick Wilson pulsates with contempt for Trump (“a man who reacts to stress in ways that are notably, demonstrably lunatic. He’s like an escaped mental patient on the Republican debate stage”) and his supporters (“Trump could tear off that weird hair of his and reveal he’s Bin Laden, and there would still be people who would vote for him”). There is no slavery, no Civil Rights Act, undergirding Wilson’s hostility — just incredulity that anybody could buy his act. Likewise, National Review’s Kevin Williamson diagnoses his party as split into “two main camps disunited by Trump’s illiterate populism.” But what is the source of this disunion? Trump supporters are “apocalyptic,” he explains, while his opponents are “happy warriors.” Williamson’s attempts to render the schism in substantive terms serve only to reveal the lack of substance. Trump supporters, he explains, view Black Lives Matter as “the announcement of a pending race war,” whereas anti-Trump Republicans like himself merely see it as “a destructive and sometimes thuggish protest movement.” How could a single party possibly contain such wildly divergent beliefs? The true source of the schism is between Republicans who intellectualize conservative impulses and those who do not. The strongest demographic predictor of Republican support for Trump is education, with college-educated Republicans far less likely to support him than those without degrees. He epitomizes low-brow, reality-show values, making himself a kind of one-man cultural wedge. But there is more to Trump’s high-low divide than that. The conservative movement has succeeded for decades by channeling racial resentment, nationalism, and authoritarianism into traditional policy proposals that can be justified in white papers on foreign policy, welfare, crime, taxes, and so on. Trump has made a mockery of this whole process, substituting boundless faith in his personality for a policy architecture constructed over generations. Conservative intellectuals understand and care about these ideas. They have articulated serious reasons for, say, restricting immigration levels, but Trump grasps the embarrassing reality that most Republican voters are driven by base animus toward immigrants. The rupture he’s opened does not divide one set of ideas from another. Trump has simply pitted the Republican brain against the Republican brain stem.